On occasion, we all give a little bit of thought to Reindeer even if they don't live in our own backyards. Because they are associated with Santa Clause, they especially get a lot of attention around Christmas. I have even known a few people who believed reindeer were fantasy or mythological animals. Reindeer are most definitely not fantasy. They are very real animals. However, they do only fly for Santa. The photo shown here is a picture I took myself of a sleeping reindeer. Reindeer, also known as caribou in North America, are indeed deer as their name suggests, but they have some very unique characteristics. For instance, they are the only deer species in which both males and females have antlers. 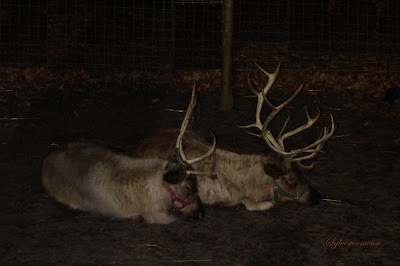 The antlers on a male reindeer can actually exceed 3 feet. 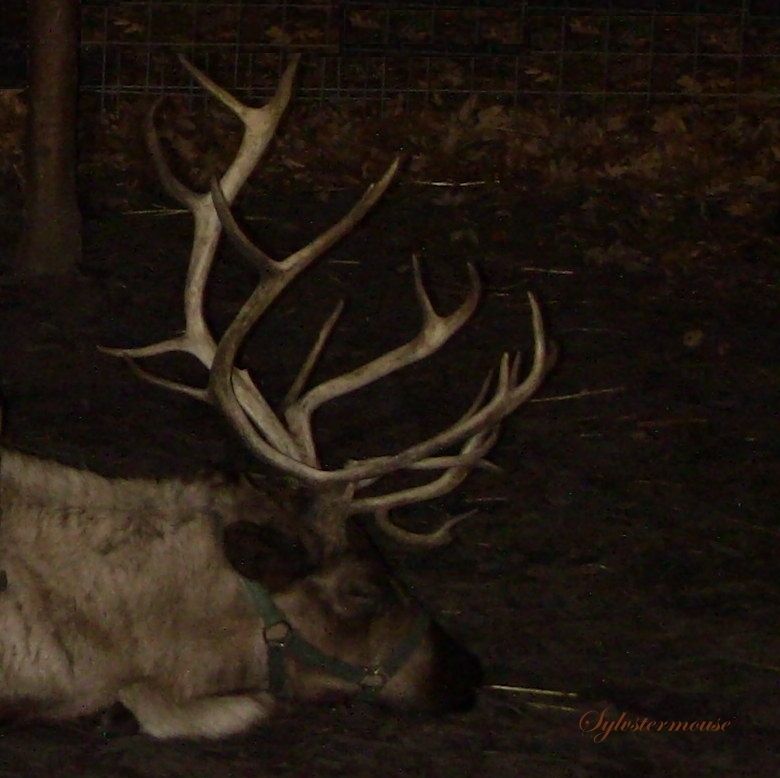 Reindeer annually drop, or lose, their antlers. Adult males lose their antlers in December, while the younger males will lose their antlers in spring. The females lose their antlers during the summer. Reindeer are uniquely created for cold weather. They had a breathing system that literally warms their bodies as they breathe in cold air. In addition to their broad hooves, they also possess a very thick coat. Now you know the truth about reindeer! They are very interesting and unique creatures which helps us all to understand a little better why "Santa" would choose these huge deer to pull his sleigh. Of course, those broad, flat hooves and their ability to tolerate the extreme cold, make them the perfect companions for elves and North Pole inhabitants. This ELF loves reindeer, therefore, I really enjoyed learning more reindeer facts. Merry Christmas to you and to reindeer everywhere this holiday season! Thank you, and Merry Christmas to you too Elf!